April is National Serger Month -Join Us for Our Sip n Serge Event! Do you have an old serger hiding in your closet? Are you thinking about making your own clothes and want a serger? Do you wish your serger was easier to use? 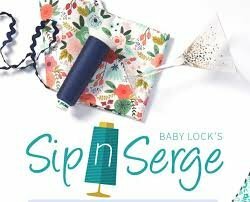 Join us at our Baby Lock Sip n Serge event for a fun-filled morning and learn all about Baby Lock sergers while you make microwave cozy. We'll provide you with everything you need- including the serger, fabric, instructions and more. And best of all we will show you that sergers are easy to learn and fun to use! Sign up today - drinks are on us!